"Paneer is an essential ingrediant in Indian cooking. Often people substitue riccotta or some other kind of cheese. But they never taste the same and paneer is so easy to make. With this simple recipe, you'll give true Indian authenticity to all your dishes." Combine the milk, yogurt, salt and sugar in a saucepan. Heat over medium heat, stirring occasionally with a whisk. As the milk is just about to boil (it will bubble at the edges), stir in the lemon juice. Remove from the heat and pour into a sieve lined with cheesecloth. Lift the cheesecloth by the four corners and tie them together. Hang the cheese in the cloth over the sink to drain. It will take 30 minutes to 1 hour. Once drained, place the cheese, still in the cloth, into a bowl and refrigerate until ready to use. 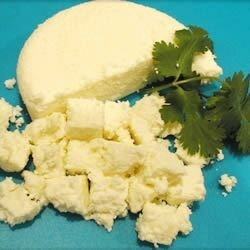 If later you want to cut the paneer into firm fingers, use a spoon to press the paneer into the shape of the bowl before refrigerating. I have no idea what I am doing wrong, but I tried this recipe twice and I didn't get any cheese. It wouldn't curdle at all. I used whole milk.